After doing well with the playful moods of movies like Paranorman and The Boxtrolls, this time Laika have aimed for epic. Though they don't eschew humour, they aim for a serious fantasy tone by telling the story of one-eyed Kubo, child of a great samurai and a celestial spirit, but enemy to the rest of his family. I really respect this change of direction and Laika in a serious mode has long been something I've wanted to see. I was a bit dubious about the fantasy-Japan setting, a little overdone just now, but it allowed for some beautiful locations and mythologically-inspired setpieces. Kubo succeeds with its characterisation and its action sequences. The characters have multiple layers and often memories they themselves have forgotten, so their development is interesting. Plus this is Laika's foremost triumph, visually. Outsize monsters, magical effects, fights with swords, bows and sickles and amazingly fluid paper-folding effects add up to a feast for the eyes. A couple of negative points for me would be in character design. I understand the link between kabuto beetles and samurai kabuto, but Beetle could have looked a fair bit less goofy. And Kubo himself had a design that looked nice as a concept drawing and in the traditional animation during the credits, but in the actual movie looked rather unattractive - I'm quite sure the movie would have had wider appeal with a better design for the protagonist. Plus, incredible though the achievement is here, the more polished and smooth stop-motion looks, the closer it gets to looking like CG. If they are indistinguishable, one starts to wonder what the point of stop-motion is. Not that we're at that point yet, and this movie pushed more boundaries than ever. But for all that it had the right ingredients and an intriguing cast of characters, I wanted to love them and there was just not enough humanity in them for that. 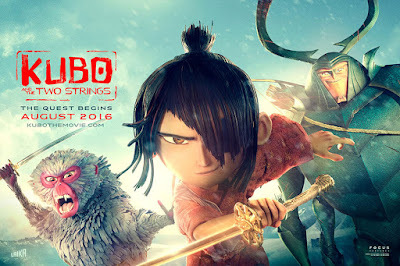 Still, I am very eager indeed that Laika continue down this path and make more serious epic animations with their own unique tone to them. Thanks for the comment! Laika films don't tend to hit the big time, except maybe for Corpse Bride, but they're a superb studio and I really recommend their films to everyone.